“As a professional trainer, I educate my clients to look for a protein bar like CLIF Builder’s that not only includes protein to build muscle, but also high-quality carbohydrates,” Mathews said. CLIF Builder’s®, the great tasting high-protein bar, revealed the results of a new survey today showing that most Americans are unsure of how much protein they need on a daily basis, even though they know other essential health and fitness facts like how much water to drink and how often they should exercise. Just 35 percent of Americans understand their protein needs, according to a nationwide phone survey of 1,000 people ages 18 and over conducted recently by CLIF Builder’s and Kelton Research. Key nutrition knowledge about protein lags far behind Americans’ awareness of other basic health and fitness concepts. For example, the survey discovered that more than twice as many Americans understand how often they should work out (76 percent) or their ideal weight range (69 percent). To help people learn about their individual protein needs, CLIF Builder’s has created a guide to protein and nutrition, including an interactive protein calculator, available at CLIFBuilders.com. The survey also uncovered widespread misconceptions about the benefits of a post-workout snack containing a mix of protein and carbohydrates. After a workout, eating protein and carbohydrates together is the ultimate one-two punch for total body recovery, explained Ron Mathews, a leading personal trainer and CLIF Builder’s ambassador. Post-workout protein repairs muscles, while carbohydrates replenish a body’s storehouse of energy. However, 43 percent of Americans believe that eating carbohydrates after a workout will cancel the work they have just done, and 89 percent reach for a protein-rich snack first, without considering also replenishing carbohydrates. Nearly half of those surveyed said nutritious ingredients are an important factor in their selection of protein snacks. Those respondents said they don’t want their protein snacks to contain trans fats, high fructose corn syrup, artificial sweeteners and sugar alcohols. 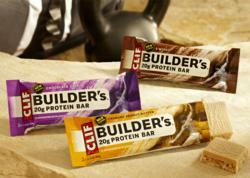 CLIF Builder’s (SRP: $1.99) is crafted for performance by athletes and foodies in the CLIF kitchen. Each bar contains 20 grams of great-tasting protein, carbohydrates for sustained energy and an optimal blend of specifically-selected ingredients that work as hard as you do so you can get the most out of your workout. Three delicious new flavors have just been introduced—Chocolate Chip and S’mores for those who crave chocolate, and Crunchy Peanut Butter for those who want to revel in the rich, creamy taste of peanut butter. In addition to the three new flavors, CLIF Builder’s is also available in Chocolate, Chocolate Peanut Butter, Chocolate Mint, Cookies ‘n Cream and Vanilla Almond. Clif Bar & Company is a leading maker of nutritious and organic foods and drinks, including CLIF® Bar energy bar, LUNA®, The Whole Nutrition Bar for Women®; and CLIF Kid®, Nourishing Kids in Motion®. Focused on sports nutrition and healthy snacks, the employee and family-owned company is committed to sustaining its people, brands, business, community and planet. For more information on Clif Bar & Company, please visit http://www.clifbar.com, check out our Facebook page at http://www.facebook.com/clifbar and follow us on Twitter at: http://www.twitter.com/clifbar. Editor’s Note: Full survey results, product samples and photos are available on request.